The nearly 3 million pilgrims who swept across Copacabana beach during the six-day celebration of World Youth Day returned home at the beginning of August with “clear instructions” from the Pope Francis. Barbara Maciel Ferreira da Silva, 16, from the Jundiai Diocese in Sao Paulo, understood the message. “We cannot continue to be oblivious to the world outside. We have to take God wherever we go,” said Silva, one of the seven young people chosen to receive a gift from Pope Francis at celebration’s closing Mass July 28. 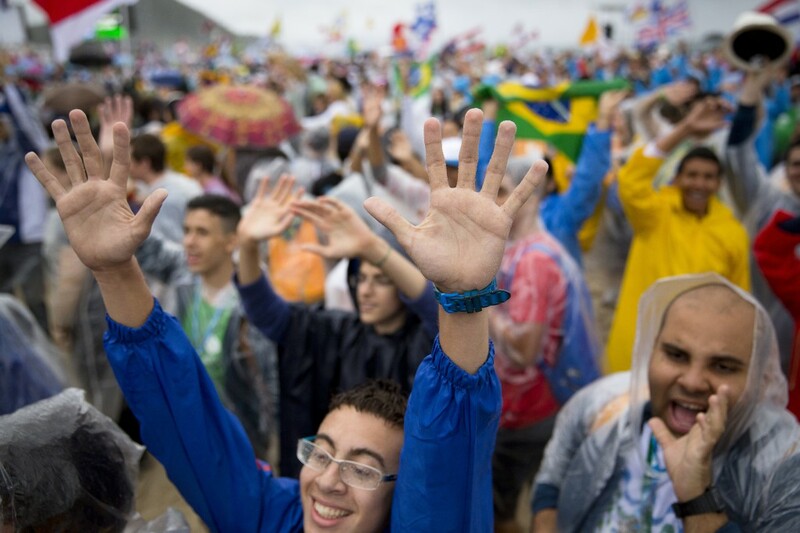 Not even the drizzle that fell in Rio de Janeiro for the first three days of World Youth Day was enough to discourage the millions of young people who came to hear Pope Francis in his official first overseas voyage. Pope Francis spoke about 20 times to pilgrims, authorities and religious during his trip through speeches, homilies and liturgies. Each time he garnered new admirers. For Bishop Pedro Luiz Stringhini, of the Diocese of Mogi das Cruzes in Sao Paulo, the celebration showed that young people are seeking an ideal to follow or a cause to take up. “They are less politicized than we were in the 1970s, but they still need to feel they are changing something in their world,” he said. And if the pilgrims at WYD needed a cause to embrace, Pope Francis’s speeches certainly inspired them. Carranza found that Pope Francis’ gestures were as strong as his words: carrying his suitcase onto the plane; giving away rosaries and asking pilgrims to pray with him and for him; thanking the residents of a favela, or slum, for opening their homes and inviting him in. Silva sees it the same way. “Young people see flaws in everything, but seeing how he was humble, that he abdicated from all the luxury just to be with us, showed us that maybe it can be different, … that we can make a difference in the world,” she said. About 40 percent of the world’s Catholics live in Latin America. The election of a pope from the region gave Catholics there something with which to connect. Rio resident, Wanda Araujo, 83, told Catholic News Service that the pope’s example is what the Catholic Church desperately needed. Fernando Altemeyer Jr., professor of theology at the Pontifical Catholic University of Sao Paulo, said that although Pope Francis’ objective at World Youth Day was not to convert youths to Catholicism, he believes that some who had strayed from the flock may return. But he does not expect them to do it simply on their own. “If the priest or nun at the parish has the same empathy as the pontiff than I think we may see a multiplying effect coming from WYD,” he said. The Catholic Church will have to wait and see whether Pope Francis’ message to youth will spread. But most Latin Americans interviewed by CNS during the celebration said they felt a deeper connection to the Argentine Jesuit.